Rockabilly is one of the earliest and most important styles of rock n' roll music to emerge during the 1950s.Its roots stem from hillbilly, country and black rhythm & blues. The music was dominated by its original exponent, Elvis Presley and has had an important influence on rock music and popular culture, despite having flourished for only a short time during the 1950s. During the late 1970s and early 1980s, rockabilly enjoyed a major revival of popularity and has remained an important subculture since. Rockabilly dancing is great fun and can be danced to a variety of dance tempos but is particularly suited to faster music. It will keep you fit and is suitable for any dance environment. 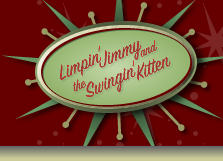 Limpin' Jimmy and the Swingin' Kitten teach in Sydney and are proud to offer dance lessons in both a group workshop setting or as private lessons for 1 - 4 people. We also offer a specialised program for Corporate Workshops and Team-Building Sessions for businesses and organisations located in Sydney.